What are your plans moving forward with Crocodiles of the world? Anything exciting you can tell us that may be planned in the future? I have so many plans and ideas for the zoo, there’s so much I want to do in terms of the visitor experience, interaction and crocodile conservation. 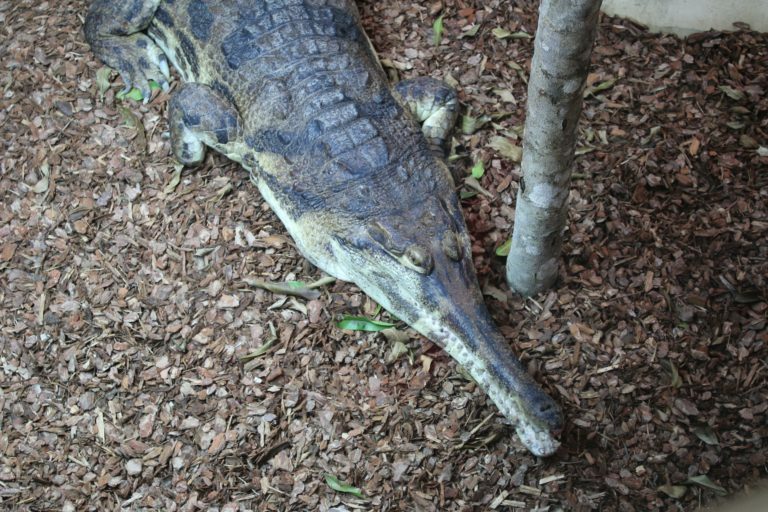 We are growing year-on-year, with the last two years focussing on new enclosures such as the outdoor education zone and extension to the main crocodile house. This year we intend to create a new larger entrance and gift shop and I’m hoping work will start in the next few months. Are you planning to move Daisy, Albert & family into new enclosure in the future and do more talks on certain days like you did at Witney site? It would be lovely to move them into a new enclosure and this is in my longer term plans. In terms of talks, we have moved on a lot since our Witney site and have a busy daily schedule with talks, feeds and animal encounters every 45 minutes. Are you planning to get a large male Saltwater and will you find a female for your komodo and have baby komodos? Yes, it would be great to have a large male Saltie on display here one day – they are such an iconic species. In terms of introducing a female Komodo, it would need careful management or the injuries can be horrific, as they are solitary animals. It would need really careful planning including a larger enclosure and acceptance from the breeding programme, so it’s not out of the question but not an immediate plan. Your little one may like this, as we are planning to hold a competition to let our supporters name our Tomistoma for World Tomistoma Day on August 5th, so keep a look out for this on our website and social media. Are there any endangered species you don’t currently have but would like to focus on in the future? 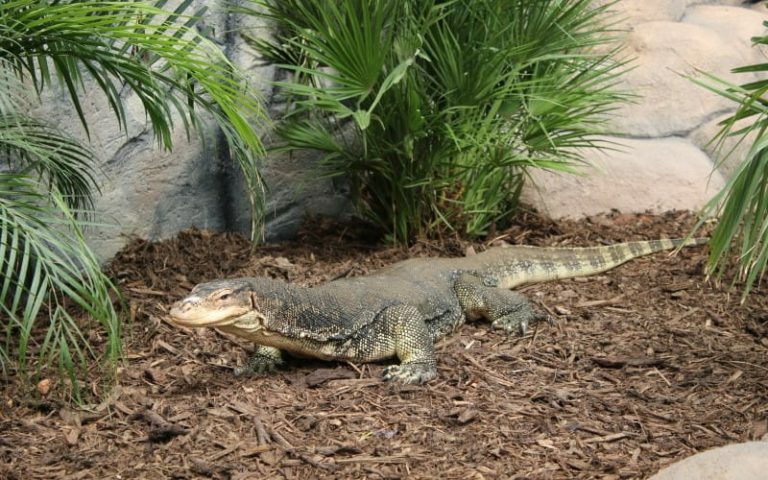 It would be great to work with Indian gharials and Orinoco crocodiles, who are both classed as critically endangered like our Chinese alligators, Cuban crocodiles and Siamese crocodiles that we have here at the zoo. Do you have a favourite croc in your zoo? Favourites for species and an individual. I don’t think people believe me when I say I don’t have a favourite, but it’s true I really don’t – it’s like picking a favourite child! If I were really forced to answer, I’d have to say Hugo our male Siamese crocodile as he’s such a good looking crocodile! I’m also really enjoying working with the Tomistoma, as they are still relatively new to us and are a fascinating species whose behaviour is relatively unknown in the wild, so it’s great to be learning about this incredible species. Do you feed Hugo and Rebecca during opening times now or they still fed before public arrives? Hugo and Rebecca, our Siamese crocodiles are two of our biggest crocodiles, so don’t require regular feeds like some of our other residents who form part of our regular feeding schedule. However, we know big crocs feeds are something our visitors would love to see and so we are working towards achieving this with some our bigger crocs, like Siamese and Tomistoma. What’s the difference between a crocodile and an alligator? The easiest way is if you get a little closer you’ll spot that when a crocodiles’ mouth is closed their fourth tooth of the lower jaw is always visible, whereas the teeth on an alligators lower jaw are almost always hidden when the mouth is closed. Now if you’re even closer and see a crocodile with their mouth open, you may see that they have functioning salt glands on their tongue which allows them to excrete salt from their surroundings i.e. the water they’re in. Hence why alligators tend to stick to freshwater habitats, as they no longer have this function. When do you feed the 2 big American alligators? 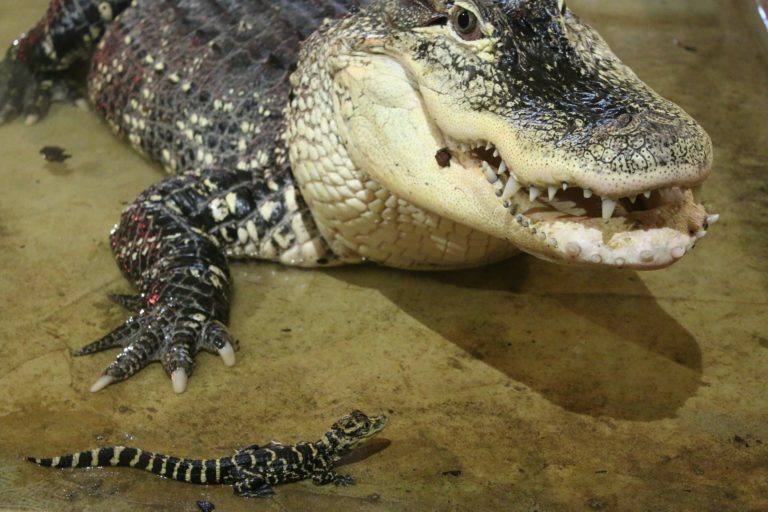 Our American alligators are currently fed out of visiting hours, as they have their youngsters in the enclosure with them and so need to be fed very calmly and carefully. Do you have to search for nests? This is made quite easy for us here at the zoo, as the species we have bred so far are all mound nesters, rather than hole nesters, so it’s very obvious when they build a nest. 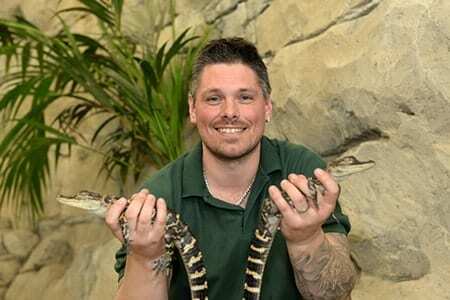 Would you ever consider beginning accredited training for captive crocodiles like management, handling or welfare (something similar to what Big Gecko are doing, but in a zoo environment) or consider introducing work experiences/ apprenticeships or even internships with the crocs for people to gain experience. Yes, this is something we’re looking into and we are in the process of setting up a professional development course, as well as a work experience programme. Updates on this will be posted on our education pages on the website. How do you see the future of crocs and gators in the wild given climate change/human interference? Great question. Inevitably crocodiles will be affected by climate change, as they are ectothermic – meaning that their body temperature is controlled by their environmental temperature. Temperature is also an important factor in the development of hatchlings. Our education team can tailor educational school/college visits to discuss this in more detail. But it’s not all doom and gloom. We actually feel optimistic about the future for crocodiles. There are some amazing field-based conservation projects, passionate researchers and so many budding supporters and it’s great to be a part of this with our work here at the zoo. I like to think that we are also helping to educate conservationists of the future and fuelling the interest of future crocodile conservationists. Thanks again for all your questions. 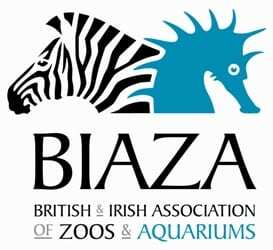 Make sure you also follow us on twitter and Facebook to keep uo-to-date with the latest news and goings-on at the Zoo!